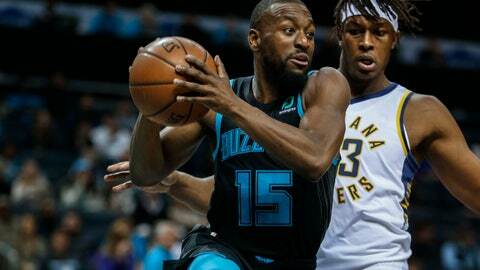 CHARLOTTE, N.C. (AP) — The Indiana Pacers paid so much attention to Kemba Walker on Wednesday night they seemed to forget about the rest of the Charlotte Hornets. Walker drew plenty of attention from the Pacers defense in the pick-and-roll after his recent scoring outburst, which allowed his teammates to get open looks from 3-point range. The NBA’s leading scorer going into the game finished with 16 points and a season-high 11 assists as the Hornets defeated the Pacers 127-109. Walker had scored 103 points in his previous two games, including 60 against the Philadelphia 76ers on Saturday night. But the two-time All-Star only attempted 10 shots against the Pacers. “About time he decided to start passing the ball,” joked Hornets coach James Borrego, who has encouraged Walker to shoot as much as he can this season. Borrego said the Hornets offense starts with Walker. Jeremy Lamb was one the beneficiaries of the open looks, scoring 21 points on a career-high five 3-pointers. He also attacked the rim well. Charlotte shot 62 percent from 3-point range, making a season-high 18 of 29 shots from beyond the arc. “Whatever the defense give me, I’m trying to take advantage of that and tonight when they were up in the pick-and-rolls I was just getting rid of the basketball and my teammates were just making shots,” Walker said. Dwayne Bacon had 18 and Cody Zeller 15 for the Hornets, who improved to 6-3 at home. Bojan Bogdanovic had 20 points for the Pacers, who played for a second straight game without Victor Oladipo, who remains out with a sore right knee. Indiana had its three-game winning streak halted. Pacers: Domantas Sabonis was 7 of 7 for 15 points before rolling his ankle midway through the second quarter. He returned in the second half, but never scored again and fouled out with 6 minutes left. Hornets: Marvin Williams was taken to the locker room in the third quarter with a face contusion and a bloody nose after taking a knee to the head from Young while on the floor. He returned to the bench, but did not play. … Malik Monk broke out of a 0-for-14 slump from beyond the arc by making 3 of 6 3-pointers. Frank Kaminsky had 11 points off the bench, which was more than he had scored all season (nine). Borrego praise Kaminsky for having a “fantastic” attitude and continuing to work hard, even though he had only played a limited role in five games this season after being a role player last year under coach Steve Clifford. Rookie Miles Bridges had a nice stretch late in the third quarter to help push Charlotte’s lead to 21 points. He knocked down back-to-back 3-pointers and then rejected shots by Thaddeus Young and Cory Joseph seconds later. Pacers: Host Spurs on Friday night. Hornets: Visit Thunder on Friday night.